Jason Allison is one of Emery’s most outstanding professional hockey exports. As an NHL player, Allison proved to be a formidable force while possessing an incredible scoring touch. His blend of fine puck handling, size, power and blazing shot created a considerable challenge for opponents. He was known for his ability to sail a wrist shot, like a frisbee, as a slow fluttering shot that would somehow always go in. Allison’s connected to the area through his attendance at Emery Collegiate and Westview Centennial Secondary School while playing hockey in Emery. Allison was born in 1975 and grew up in a home along Imogene Road off Weston Road. As a youngster, Davy Palumbo of nearby Fernando Road was a childhood friend of Allison’s. The teenagers would play street hockey together with other area boys. They would play these games after school on Fernando Road, just off Imogene. At the time, Allison was known to be a bit of a hard nose in the games. The Humberview Huskies Hockey Club established ice hockey for local boys and Allison signed up. To get to the rink, rather than walking down Weston Road, Allison and his grandfather would sometimes walk the short distance along Fernando Road to Habitant. With grandson in tow, both used the side-street while Allison would be spotted always carrying his own hockey bag. Both would proudly be seen with their matching green Humberview hockey jackets. Allison rapidly progressed in skill and intensity and moved up to compete in the MTHL, where he played for the Toronto Red Wings. He upped his game another notch, advancing to Ontario’s uppermost league. From 1991–94, he enjoyed a stellar junior career with the London Knights in the OHL. His greatest season was in 1993–94 when he scored 55 goals and had a total of 142 points in just 56 games. He was drafted 17th overall in the 1993 NHL draft, by the Washington Capitals. At 6’ 3” and 215 lbs., he had all the signs of a serious offensive threat on the ice. In 1994 and 95, Allison represented Team Canada in the World Junior Hockey Championships. Over the next two seasons with the juniors, he accumulated 24 points in just 14 games. During the 1994–95 regular hockey season, Allison shared time with the London Knights, the Portland Pirates of the AHL and the Washington Capitals of the NHL. He then played consistently for the Capitals until 1996–97. It was with the Boston Bruins that his game would take on a different level. He skated for the Bruins from 1997 until 2001 where he averaged around point a game. He will forever be identified in hockey circles for this impressive singular statistic. In his final season as a Bruin in 2000–01, Allison racked up 95 points in just 82 games and played in the NHL All-Star game. After departing the Bruins, he played two seasons with the Los Angeles Kings. According to Allison, he was the second fastest skater on the team from blue line to blue line. In his two seasons with the Kings, he had 102 points in 99 games. For the 2005–06 season, the Ontario boy finally got a chance to sign with Toronto where he could proudly return as a home-town hero. 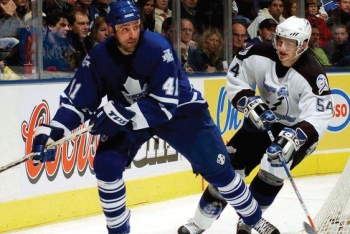 Linemate Darcy Tucker called Allison the “Dictator” from his masterful ability to control the play. In 66 games with the Leafs, he scored 17 goals and had 60 points before a hand injury sent him to the sidelines. After the season, Allison became an unrestricted free agent and head coach Paul Maurice and GM John Ferguson, Jr. decided not to re-sign him. Contrary to prevailing public support, they felt the forward wouldn’t be a proper fit in the new vision for the Leafs, as a young, fast-paced team. Despite rumours of having multiple contract offers from other teams, Allison did not sign with any other NHL team. After a three year hiatus, in August 2009, Allison got back on the ice for a final crack with the Leafs. The team had different management in place and he hit the ice hard and fast to prove that he could once again play for his hometown team. In one of the Leafs’ exhibition games, Allison was involved in a fight with the Philadelphia Flyers’ Darroll Powe. To the delight of many Toronto fans, Allison ripped Powe’s helmet in half with his bare hands. In the interview after the game, Allison was as confident as ever. His bid to make the team fell short, as on Sept. 28, 2009, Leafs coach Ron Wilson announced that Allison was out of the Leafs’ long-term plans. Allison ended his NHL experience as a Toronto Maple Leaf. In all, Jason Allison played in 552 games in the NHL and racked up 154 goals and 331 assists for a total of 485 points. He was able to preserve his one point per game credentials in post-season games amassing 25 points in 25 career playoff games. Recently, Allison has been residing north of Toronto and remains actively involved in hockey. The Emery BIA looks forward to having him return to Emery in the spring of 2018. It is to take part of an official sign unveiling and dedication ceremony. It is expected to be a most historic day. Coinciding sign unveilings for musicians Alfie Zappacosta and Claudio Vena are expected to occur, as well. 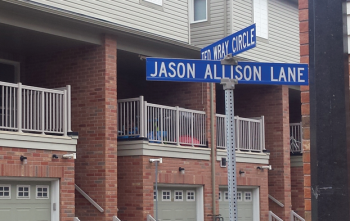 With a couple of Emery’s former NHL’ers to be honoured, the day will honour both Allison and Adam Oates with their street name dedications, located just east of Torbarrie Road.